High-flying daredevils on motorcycles kicked off Grand Prix weekend in Long Beach on Thursday night, as hundreds of race fans lined the streets. "This is incredible. Those guys put their lives on the line to do this for us. It's great," said Jose Duran, a race fan. 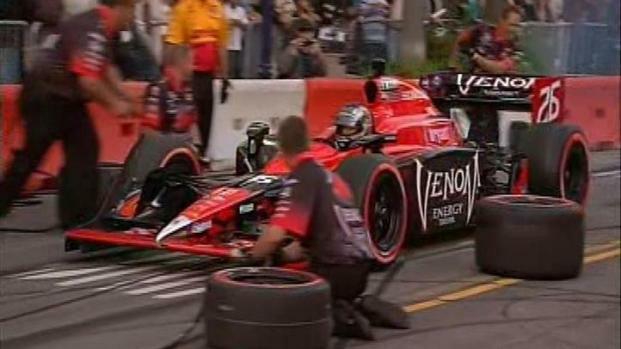 It's known as Thunder Thursday, the traditional start of racing's biggest event, the 37th annual Toyota Grand Prix, where the streets of Long Beach are turned into a massive race track for four days. "This weekend I'm looking forward to a great race, like every year, the race is fantastic. Everybody from all over the world comes and converges, right here in Long Beach, and it's good for us," said race fan Rod Davis. Rubber burns, and cycles fly as Thunder Thursday is off with a roar. Fans are celebrating racing once again returning to Long Beach. Last year's Grand Prix winner says the course is challenging, but he's confident he can pull it off again. "The track is ever evolving because of all the rubber that goes down. It's a street the rest of the year, and this week it's a racetrack, so, it really changes," said the 2010 Grand Prix winner, Ryan Hunter-Reay.